Abstract: Lithuania’s name was first mentioned as Lituae (the genitive form of the Latin word Litua) in the entry for March 9, 1009 AD in the Annals of Quedlinburg recording the martyrdom of St. Bruno. Recently, a significant contribution to the question of the origin of the name of Lithuania has been made by Artūras Dubonis, who used historical evidence to support his hypothesis that the primary form of the Lithuanian ethnonym was leitis (the ethnonym leitis is still used in Latvia for “Lithuanian”) and that in some historical sources Lithuanians were called leičiai in the fourteenth and fifteenth centuries. Tomas Baranauskas analyzes this theory as well as earlier historical and linguistic arguments on the origin of Lithuania’s name. 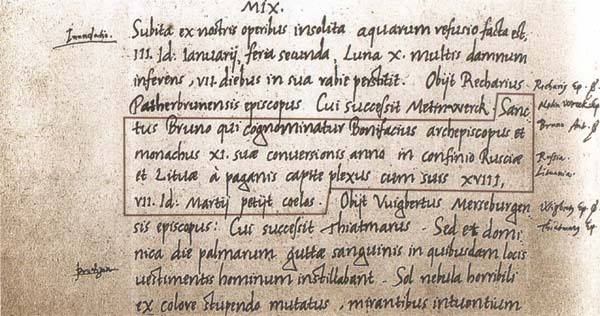 Introduction: The name “Lithuania” (Lituae) is first mentioned in the entry for March 9, 1009 AD in the Annals of Quedlinburg recording the death of St. Bruno of Querfurt. Another reference, in the Chronicon Thietmari written by Bishop Thietmar of Merseburg, gives the date for the same death as February 14, 1009 without, however, mentioning the name of Lithuania. This latter date is likely more reliable because Thietmar of Merseburg was a relative and a fellow student of Bruno’s, had been an associate of Bruno’s father, and was very possibly the author of a lost book on Bruno.